We’ve recently discovered a problem at the house that I couldn’t find a prepackaged remedy for at Home Depot. Our 16 month old son has taken a particular fascination with the wine bottles in the kitchen wine rack. We’re not sure if he’s just trying to get into the sauce a little early, or if he’s looking to try to take out his big sister with a quick crack over the head. Either way, we can’t have that. I sat down and brainstormed. I wanted something fairly inconspicuous that would allow us to leave the bottles on display for guests to see and choose. I also didn’t want to hide them all away and leave the rack looking empty, alone and abandoned. My solution is very easy and very economical. 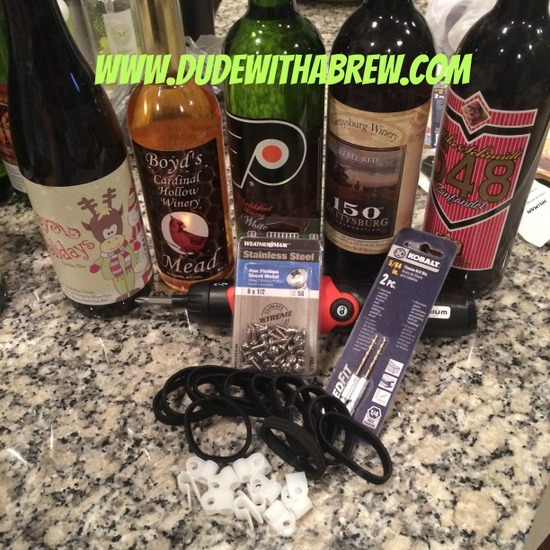 I outfitted the entire wine rack for less than $10.00. 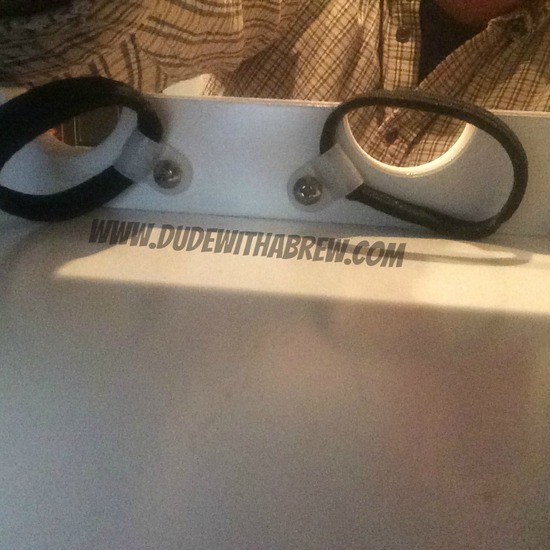 All you need are dollar store hair bands, 1/4″ tubing clamps, and screws. For the hair bands, I selected a wide flat black band. Be sure to get enough to do all the bottles in the rack. I didn’t have enough and wasn’t able to get another matching pack so I had to change them all out so they would match. I found the 1/4″ tubing clamps in the hardware aisle at Lowe’s. They were in the specialty drawers. For the screws I chose #8 x 1/2″ sheet metal screws. Assemble the clamp by inserting the hair band into the tubing clamp and putting the screw in the attachment hole. Be sure to drill a pilot hole for your screw to minimize the possibility of splitting the wood. 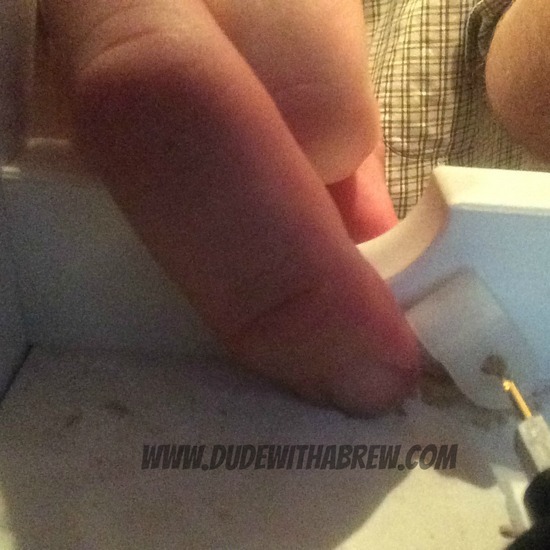 I used a 1/4″ hex drive 5/16″ drill bit in my electric screwdriver to do this. 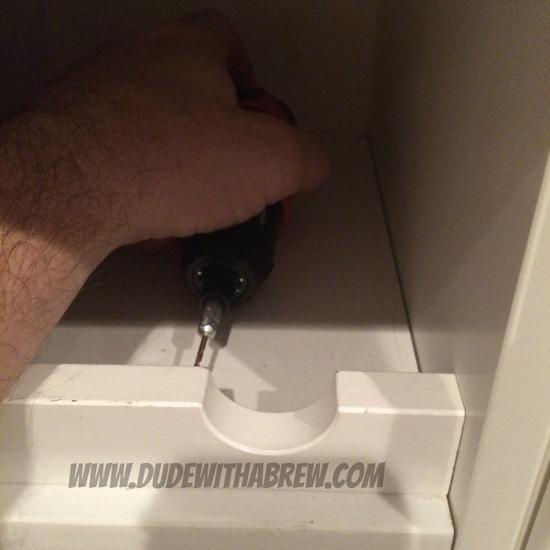 My rechargeable drill doesn’t fit into the opening and there was no way I was taking the cabinet apart to do this. BE CAREFUL NOT to drill through the face of the cabinet. (It could be a long cold night on the couch if you do). Hold a tubing clamp with your finger to guide where you will drill. Marking it with a pencil is out of the question unless you have a teeny little head that will fit in the hole with your arms. I had to put mine a little off center as the clamp was too long to place centered under the neck. Install the assembly in place and secure the screw using the power screwdriver. Again, most other tools aren’t going to fit in there. 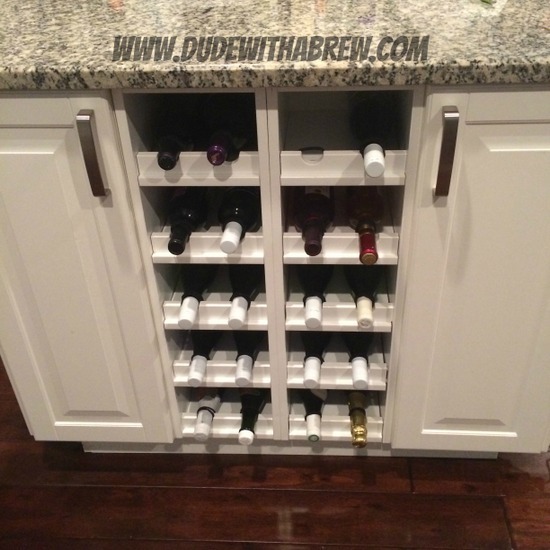 After you have the holders installed and before you put the bottles in, grab some towels and clean out the wine rack. 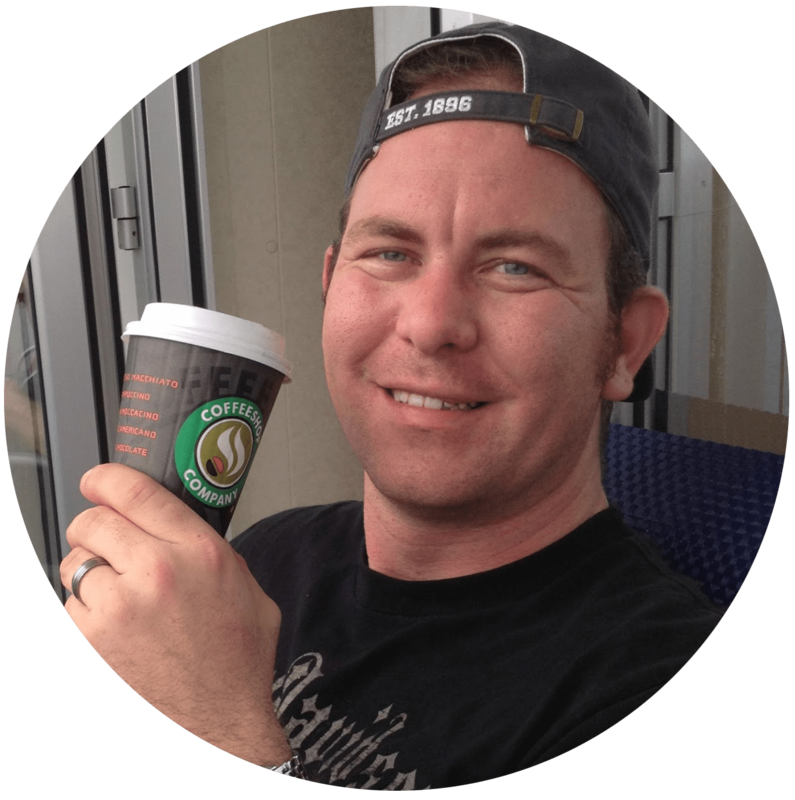 You’ll look like a superhero to your wife if she’s glaring over your shoulder. 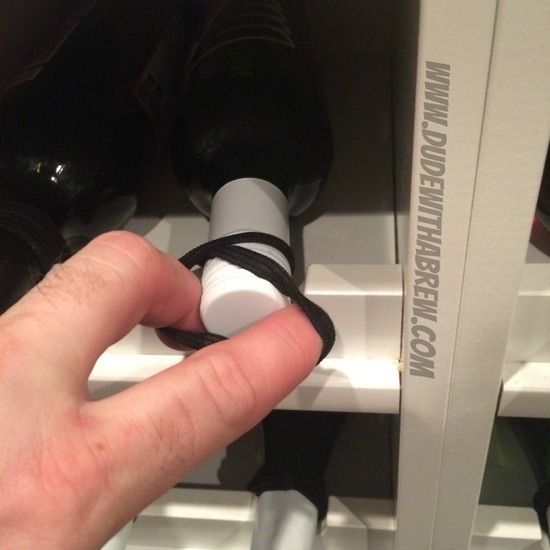 To secure the bottle, insert it into the rack and pull the hair band over the bottle. Then, twist the band and pull it back over the bottle again. 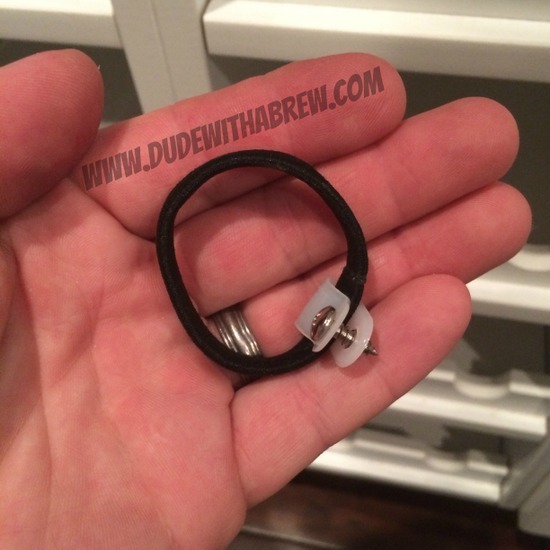 The second wrap is what will prevent the bottle from just slipping through the hair band. 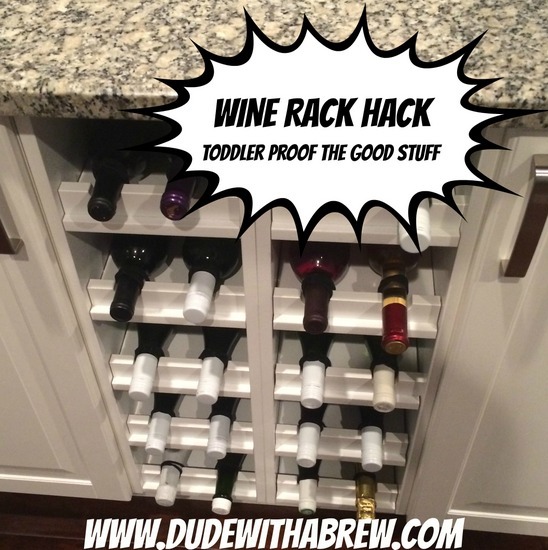 Place all the bottles back in the wine rack and secure them. Then you can get the curious toddler and test it out for yourself. Just be prepared, they’re gonna be angry that the grape juice is secured. Landon was a little upset at first, but quickly lost interest and now he barely even attempts to play with them. Here is the finished project, and as you can see (or not really see – being the point) is that the bands are fairly inconspicuous. From the video below you can see that Landon is not pleased with the success of this little hack project.